Is Morgan Freeman Dead? His wife, Son, Height, Religion, Is He Gay? Home Actors & Actresses Is Morgan Freeman Dead? His Wife, Son, Height, Religion, Is He Gay? Legendary Hollywood actor, Morgan Freeman, who started his career behind the cameras after trying to become a fighter pilot in the United States Air Force, is one of the most-respected performers of his generation. The Golden Globe Award-winner, who is also a driector, producer and narrator/voice-over artist thanks to his deep voice, has appeared in more than 50 different movies including classics such as ‘Driving Miss Daisy’, ‘The Shawshank Redemption’, ‘Million Dollar Baby’. Find out more about his personal life, family, religion, sexual orientation, and if he is alive or dead. Freeman was born in Memphis, Tennessee on June 1, 1937, as the fourth child of his parents; Morgan Porterfield and Mayme Edna (née Revere) Freeman. He attended Broad Street High School in Mississippi, where he graduated from in 1955. Having already started acting at an early age of nine and winning a statewide drama competition while in high school, Freeman declined a partial drama scholarship to attend Jackson State University. He instead chose to enlist in the United States Air Force where he hoped to be a fighter pilot. His dreams did not come through as he was only qualified for on-the-ground activities where he worked as a technician and repairman in the tracking and radar department. Freeman rose to the rank of Airman 1st Class before leaving in 1959. He fell back on what he was good at, acting, after leaving the military and moved out to Hollywood to pursue his dream. While in Los Angeles, Freeman took acting classes and worked as a transcript clerk at the LA City College to survive. After a while, he moved to New York City where he worked as a dancer and also did some petty jobs to get by, while still auditioning for some roles. He became somewhat of a sensation in theater work, winning three Obie Awards for different roles he played including the classic, ‘Driving Miss Daisy’ where he appeared as a chauffeur for a Jewish woman. The play was a huge success and led to a screen adaptation. It garnered Freeman an Academy Award nomination. However, before the screen adaptation of Driving Miss Daisy in 1989, Freeman got his first taste of a TV-production role in 1979 on a children’s show called ‘The Electric Company’. In the 1980’s, he began to appear in both movies and TV productions. The movie that changed his life was ‘Street Smart’ where he played the role of a pimp. It earned him a Best Supporting Actor nod at the Oscars. By the 1990’s, Morgan Freeman had become an A-list Hollywood actor. He attracted a lot of work and had the power to choose what he felt would best suit him. He went on to work in a lot of big-budget films such as ‘The Shawshank Redemption’, ‘Seven’ and ‘Deep Impact’. In 2005 he won an Oscar for his role in “Million Dollar Baby” and a few years later in 2012, he received the Cecil B. DeMille Award for “outstanding contributions to the world of entertainment” at the Golden Globes. Morgan Freeman is not dead. He is just one of the latest targets of the online celebrity death hoax wave that has been going on for a few years. The false story claims that Freeman died on 5 October 2017 from natural causes but that is very far from being true. Morgan Freeman has been married and divorced twice. His first marriage was to Jeanette Adair Bradshaw and the second was to Myrna Colley-Lee. He married Bradshaw as a struggling actor in 1967 until 1979, just before he caught his big break. His second marriage to Colley-Lee was in 1984 and it lasted for 23 years before the couple separated in 2007 and completed divorce proceedings in 2010. 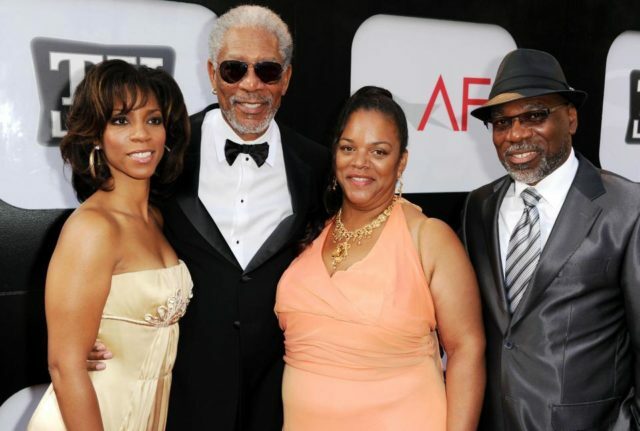 Freeman has four children; two extramarital sons, Alfonso Rene Freeman, born in 1959 and Saifoulaye Freeman born in 1960. He, later on, had a daughter, Morgana Freeman, born in 1971, with Bradshaw before adopting Bradshaw’s other daughter from a previous relationship, Deena Freeman. His first son, Alfonso Freeman, is an accomplished stage actor and gospel singer who has appeared in movies like ‘Seven’ and ‘Bucket List’ alongside his father. Morgan Freeman, the actor who played God in ‘Bruce Almighty’ and its sequel, ‘Evan Almighty’, does not quite believe in God, but rather says he is a man of faith. He also does not consider himself to be either an atheist or an agnostic. Morgan Freeman is not gay. He, however, supports the gay rights movement and has actively helped in campaigning for their causes. In 2012, he narrated an ad for the Human Rights Campaign which was pushing for equality regardless of sexual orientation.